At Janco Dada Museum in Ein-Hod, Israel, Baltensperger + Siepert present an installation consisting of two pieces, which offers a neutral thinking space to question common power structures. The centerpiece is based on the artists’ concept of Imaginary Landscapes, which will be presented as a huge wallpaper collage. 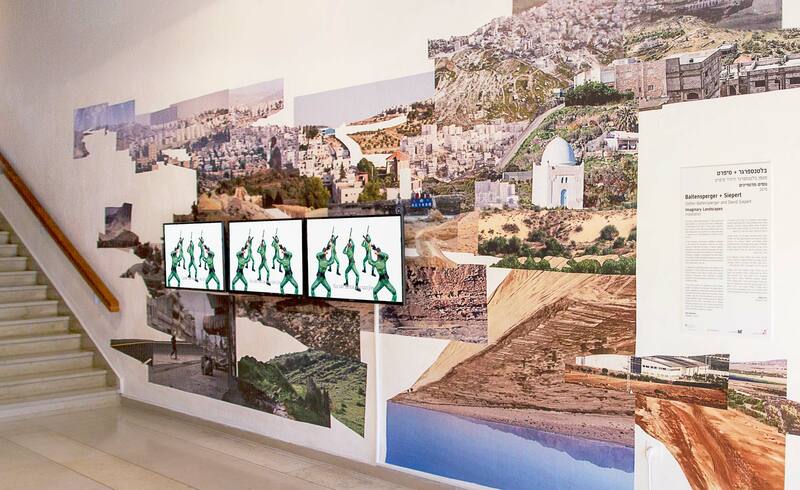 Imaginary Landscapes is based on an archive of photos of Israeli installations that border the neighboring countries and territories, which Baltensperger + Siepert collected from the Internet. The artists physically cut the photographs into pieces, thereby removing all border installations. The artists then recompose what is left to form a new, imaginary landscape. With Imaginary Landscapes the artists question power structures based on national territories. Through the gestures of removing border installations and recreating alternative landscapes, Baltensperger + Siepert open a field for imagination, to claim its space and create potentially new ways of thinking about what is in between. The second part of the installation is based on Baltensperger + Siepert‘s video piece, Dancing Queen. The title is taken from ABBA’s catchy 1970s’ disco song, “Dancing Queen,” which also builds the acoustic background for this video. Acting in the video is a battery-powered toy soldier that was originally designed to crawl on the floor. From time to time, the toy soldier interrupts its movements, lies still, and pretends to shoot before he continues to gain ground. For their video, Baltensperger + Siepert simply changed the soldier’s position from horizontal to vertical and adjusted the speed to the rhythm of the sound. In that new position the motion, which was designed as a military gesture, transforms into a dancing move, a gesture of joy and absence of worry. With “Dancing Queen” Baltensperger + Siepert offer a simple, yet significant shift of perspective, and question the common practice of responding to conflicts with military violence. At Janco Dada Museum the Dancing Queen video will be running in synch on three screens vertically arranged and overlapping with the wallpaper installation. Presented as a triptych, in a setting of exaggeration and multiplication, the visual expression of the installation repeats visual patterns of representations of power, but it also tries to resolve them through its bizarre appearance.